Rajasthan Royals 1-121 (Ajinkya Rahane 62*, Sanju Samson 50*, Jason Behrendorff 1-28) beat Perth Scorchers 120 (Adam Voges 27, Liam Davis 18, Kevon Cooper 4-18, James Faulkner 2-16) by nine wickets. The visitors were bowled out for 120 on the last ball of the 20th over and the hosts powered 121 for the loss of just one wicket with 21 balls remaining. Kevon Cooper (Rajasthan Royals) was announced ‘player of the match’ for his lethal bowling in the game. The 15th match of the Champions League Twenty20 was held on Sunday, September 29, 2013, at Sawai Mansingh Stadium, Jaipur. Earlier, Rahul Dravid, the skipper of Rajasthan Royals, won the toss and opted to chase. Liam Davis along with Ashton Agar started off brightly as the first got 12 runs in the second over with a couple of fours. Davis was gone in the next over for 18 and Agar followed him after scoring 10 runs when his captain, Simon Katich and Adam Voges joined at the crease. The latter hit 3 fours in the coming overs and Katich hit two boundaries but was smartly stumped by Sanju Samson off Pravin Tambe for 12. The third wicket fell at 62 in 8.5 overs and that was the beginning of the disaster for the tourists. The rival bowlers took over and the batsmen were going back to the pavilion one after another without much resistance. Voges became the fifth victim at 77 at his individual score of 27 from 21 balls with 3 fours. Jason Behrendorff was the only other batsman who entered the double figures by scoring 12 runs as the innings of the entire Perth Scorchers team was folded back for 120 in 20 overs. 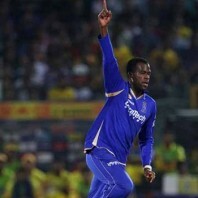 Kevon Cooper was the star of the day with four wickets, James Faulkner and Pravin Tambe shared two each whereas Shane Watson held one wicket. Rahul Dravid was clean bowled by Behrendorff for a duck as Sanju Samson got together with Ajinkya Rahane who posted the first four of the innings in the second over. Samson added 2 fours in the next one and the boundaries started pouring in at regular intervals. The duo accumulated 22 runs in the sixth and seventh over with 1 six and 2 fours as the total touched 75 in 10 overs. Ajinkya Rahane was dropped at 45 in the 14th over and he smashed his 14th Twenty20 fifty in the next one with a big six. The hundred of the innings was also posted on board in the same over while Sanju Samson reached his third Twenty20 half century on the second ball of the 17th over. Rahane got a single on the next ball and won the match for his side as the screen displayed 1-121 runs. He remained unbeaten for 62 off 53 deliveries with 2 lofty sixes and 5 fours whereas Samson was at the other end at 50 from 42 comprising 1 six and 6 fours. Rajasthan Royals beat Perth Scorchers with a big margin of nine wickets, they secured four points and have qualified for the semi-finals spot.